I reread this book recently with my book group. I use the word “reread” in a qualified sense because I know that as a teenager I never finished it. I was surprised to discover that I must have made a fairly substantial dent in it, though, because the scene I remember most vividly is one some hundred pages in, where the young Mick Kelly sneaks under the window of one of her neighbors and is smitten by the music of Beethoven. I also saw at least some part of the movie, but it is the mood more than the story line that has stayed with me. Curiously many of us seemed to have the same confused sense of having read or at least watched the story before. We had read McCullers’ The Member of the Wedding together some time ago, and there are some similarities, so that could be part of it. The Heart is a Lonely Hunter begins in the measured and inevitable cadence of a fairy tale. Once upon a time two deaf mutes lived in a small Southern town and made their lives wholly of each other. One of the pair becomes physically and then mentally ill and is sent off to an institution. The other, Singer, though missing his friend, must somehow live without him. He finds a boarding house and then a diner where he eats regularly. The story then segues into the lives of the people he encounters in these two places. Or you could say that the story starts again. We meet all of the principle characters in this second opening, which is presided over by the café owner Biff Brannon. It’s late at night, but Singer is there, and all the others wander in and out: the restless radical, Jake Blount, the proud black doctor, Copeland, and even twelve year old Mick Kelly. If the first section reminded me of a fable, this chapter reminded me of the play The Time of Your Life. The café functions here very much as a stage set would. The characters then take off on their own trajectories, sometimes crossing and colliding in the pages that follow. All find some kind of solace in the mute’s presence, or in his mute witness to their lives. But their projections don’t sustain him in a reciprocal way. 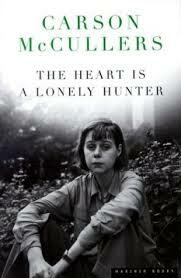 What was striking to us in this reading was the fact that McCullers began writing this when she was twenty and was only twenty-three when it was published, causing her to become a literary sensation. One member of the group called the book an ethnographical study, as McCullers was able to speak of so many different strata of small southern town life authoritatively. But I think her feat was even more amazing than that. That at twenty and having grown up in the segregated South, she was able to see into the mind of a proud, elderly, black doctor, and understand both the reasons for his pride and also how it would prove to be his undoing seems unfathomable. But the same is true of all her characters. As a girl, she must have been one on whom nothing was lost. I’ll close by adding some links to a short biographical article on her life which is both entertaining and rather scathing, and then a video clip in which you can see McCullers in a rather odd interview, which I think paints a somewhat different and kinder picture of her.